Since Trump’s victory on Nov. 8, many in minority communities across the country have expressed concern for their safety, given the president-elect’s statements on the campaign trail. During the prolonged campaign, Trump spoke about banning Muslims, deporting the undocumented, building a wall on the Mexico border, and imposing widespread stop and frisk policies. Many of his statements were seen as racist, particularly by those who felt targeted by his rhetoric. At the DIC, Kaiseruddin spoke of the fear among Muslims in the aftermath of Trump’s election. He said he was receiving news of children frightened to go to school, afraid of being bullied or singled out, of students being harassed, of women having their hijab pulled off. The Southern Poverty Law Center said on Nov. 14 it had recorded 315 incidents of hateful harassment and intimidation against Muslims since election day. During his message, he recited a passage from the Quran where Allah assured his followers that after pain comes ease. “There is no reason to despair because our trust is in Allah and no one can do any harm whatsoever if Allah does not want harm to be done to us. That’s absolutely the truth,” he said, before launching into a plan of action. He told the assembly essentially to get involved in their community (at mosques for example), help other minorities and report any hate crimes to the police. 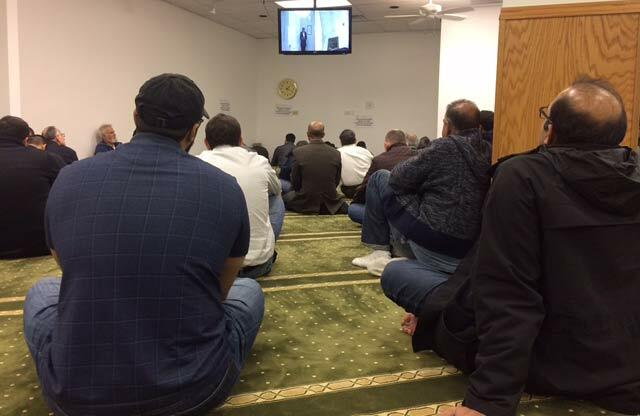 Muslims in Chicago seem to have found solace and support in the mosques, which is what Kaiseruddin said he hoped for as he preached for them to reach out to other communities feeling just as vulnerable. Other mosques and Muslim organizations across the country have echoed similar sentiments as they deal with their anxious communities. The Islamic Society of North America, a 40-year-old organization considered the largest of its kind, issued a statement on Nov. 11 in which it asked Trump to engage with the Muslim community as well as other minorities. “Trump will provide a great service to the nation by assuring fellow Americans his administration will not abandon fundamental values of cherishing equal protection of the law and equal opportunities for all Americans, regardless of race, national origin, gender, religion, or other constitutionally protected categories,” it said. The group’s website has also listed resources available to Muslims in the wake of the election result from helplines, articles on how to talk to children and organizations offering counseling services. Mahin Islam, one of the hosts of the podcast Mad Mamluks, a show which discusses current events facing the Muslim community in the U.S., and invites guests to share their stories about the work they’re doing, shared his thoughts on the election. He and his co-hosts, Murtaza (who goes by the one name) and Syed Imran Muneer (known as SIM) invited Boston-based Muslim scholar Joe Bradford on Nov. 9 to talk about election results on the podcast. “To be honest, I accepted the results pretty quick because it is what it is,” said Islam, adding he wasn’t firmly in the camp of Trump being the greater of the evils compared to Hillary Clinton. In the podcast, SIM echoed something similar when he said a vote for Trump was a vote against the establishment and he may have gone that way, too, had the Republican candidate’s rhetoric not been so hostile to minorities. Now, however, he said he is more concerned about the individuals being considered for appointments, like Frank Gaffney, head of Center for Security Policy, a right-wing think tank and former defense official in Ronald Reagan’s administration. He’d heard of hate crimes being reported but had not experienced anything himself, nor had he heard of anyone in his social circle experiencing any conflict or confrontation since the election. And there are Muslims who are delighted about the presidential electi results. “There’s nothing to worry about,” said Pakistani-born businessman Talat Rashid, who has supported Trump since the Republican candidate announced his decision to run in 2015. Rashid, who has been living in the Greater Chicago area for the last 30 years, believes Trump’s Muslim ban proposal was simply political rhetoric. Rashid, who has been invited to attend the inauguration ceremony in January, has no qualms about the future of Muslims or other minorities in America. “People who are illegal should definitely be sent back, and they should come to this country through the proper channel if they want to,” he said. Asked about Trump’s proposed changes in foreign policy, especially toward enemy combatants overseas, Rashid brushed it off as populist messaging too. “They (the Trump administration) have to survive in the international community. They can’t afford to make everyone angry,” he said. On a webcast broadcast on Nov. 16, eminent Islamic scholar, Imam Zaid Shakir, co-founder of Zaytuna College in Berkeley, California, said it was imperative for Muslims to be principled in their responses to Trump’s rhetoric. Shakir, who is considered one of the most influential Muslims in America, warned Muslims against viewing themselves solely through the prism of safety and security, and reminded his audience of a time in the 1960s, when people like the iconic boxer Muhammad Ali took great risks to uphold the principles of their faith. “As a Muslim [men like Ali and Malcolm X] could stand up and defy the war machine,” Shakir said, adding that Muslims should turn for stimulus to the civil rights movement, which he described as not just a protest movement, but one that built on a sense of identity and purpose. He said the fear that provokes some Muslims to talk of distancing themselves from their heritage in an effort to assimilate — including talk of shaving beards or removing hijab—comes from a lack of confidence in their identity. Rather than shrink away from their heritage, he asked his listeners to revel their rich history in this country, a history that dates back to the Muslim slaves who were brought here from present-day Senegal. “If you own that, no one can tell you that you don’t belong,” he said. Shakir was joined on the broadcast by Shaikh Hamza Yusuf, also co-founder of Zaytuna College in California. Yusuf stressed the importance of the community being calmed down and devising a long-term strategy to deal with any fallout from the election. Still, in spite of the efforts to calm nerves in the Muslim community, a sense of unease remains following the election. Saman Shaikh, 38, a Pakistani-American woman who is married to a professor of mathematics at East-West University in Chicago, said she never felt marginalized in the U.S.—despite arriving here right after 9/11—until this year. The mother of a 1-year-old daughter, who has been applying for jobs for the past few months, said that lately, she can hear the voice on the other end of her phone interview deflate when she says she’s from Pakistan.